I had a rare Saturday to myself, without Boyfriend or social obligations (There was a pretty amazing party later that night to celebrate White Linen Nights in the Heights, for those of you who know about Houston good times. ), so I decided to rearrange the ever-growing makeup collection! Anyway, all that is to say, I needed to go through the pile-o-makeup to choose “special occasion” stuff to keep in the bathroom and collect the day-wear into a single bag. During this process I realized I did not own an adorable makeup brush holder! (Outrageous, I know.) 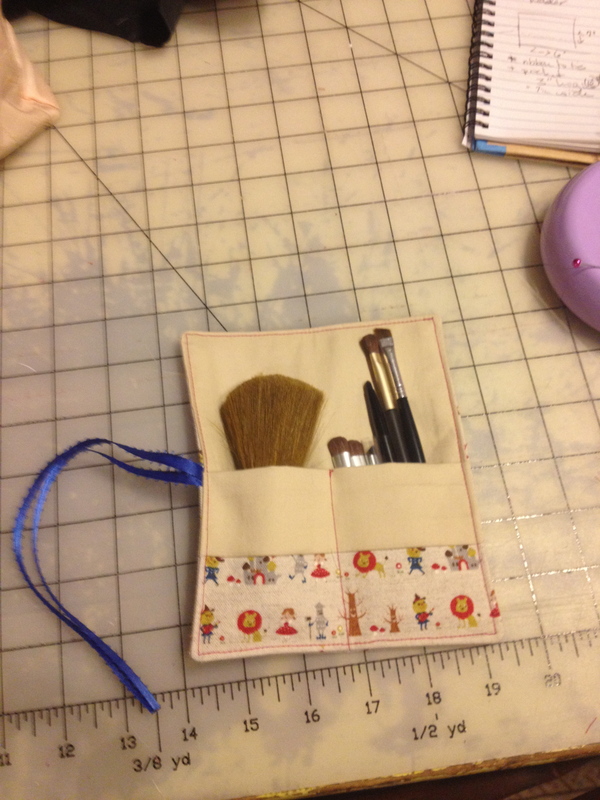 Since I already own several brushes I didn’t want to go out and purchase a cheap holder with equally cheap brushes, nor was I interested in spending additional monies when I have such a delightful skill set as sewing! 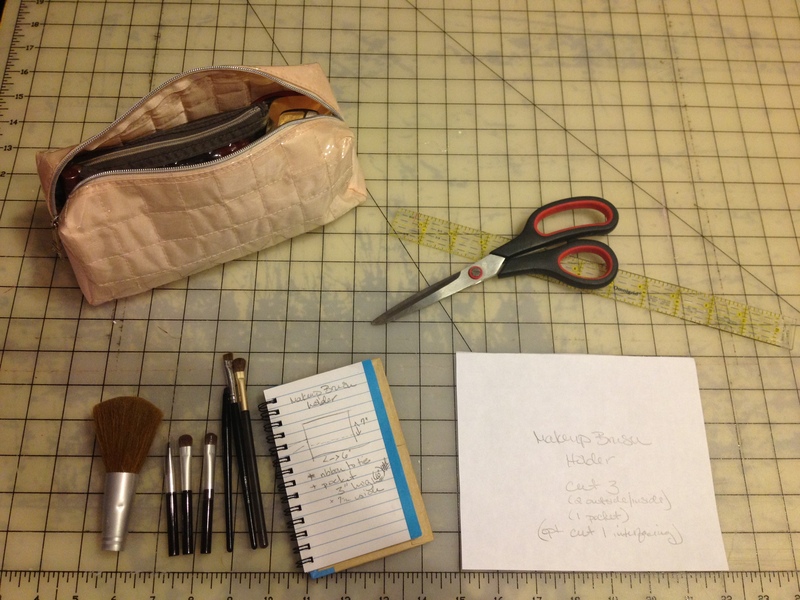 I measured my makeup bag, and decided the MBH would have to be no more than 7” to fit neatly inside. My brushes only required about 6” width, so the pattern piece turned out to be 6” x 7” giving it a 1/2” seam all the way around. I created this simple pattern, which is used for all three pattern pieces (inside, outside and inside pocket). Then I got to the best part: choosing fabric! 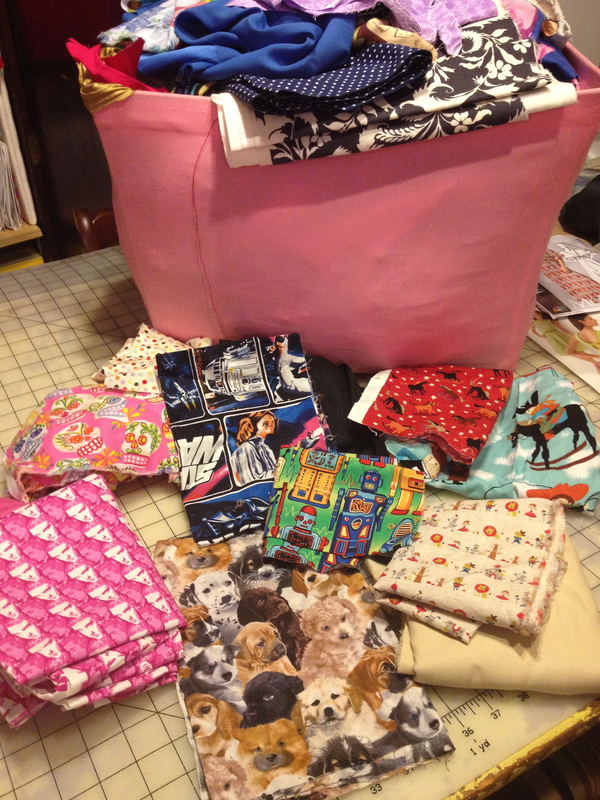 I have a pretty enormous “scrap bin,” so I took the opportunity to dump it out and dig through gleefully. I had some pretty stiff competitors: pink Dia de los Muertos with polka dots, fabulous pink Elvis faces, Star Wars, robots, Alexander Henry’s super cute cowboy collection, Japanese “Wizard of Oz” linen, and PUPPIES! The “right” side, now with much more cuteness! Otherwise, you would first cut three identical pieces out of which ever fabric combination you choose. *If you are using a lightweight fabric and want a little more structure, add some iron-on lightweight interfacing to the outside fabric piece. Next step was to fold the inside pocket in half (handy/easy way to make a clean seam on the inside! ), and baste/attach to the inside piece. 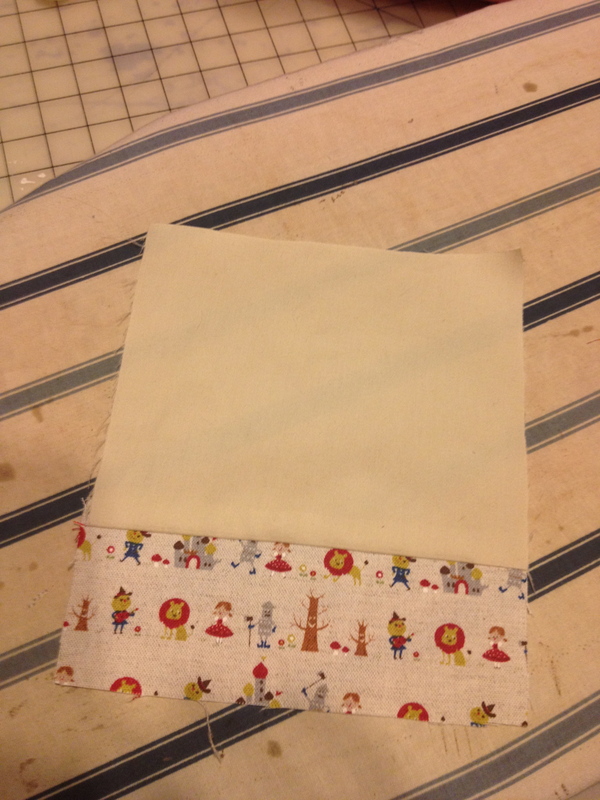 You can make as many pockets as you’d like, since I only needed two, I sewed a single center seam. 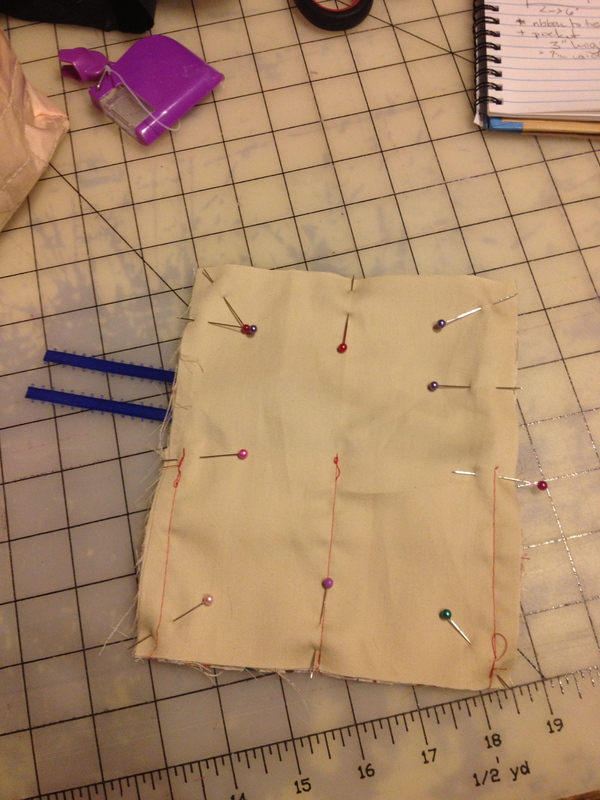 Doing this keeps the pocket from moving around while you sew the outside and inside together, as well as making the center pocket seam invisible from the outside! 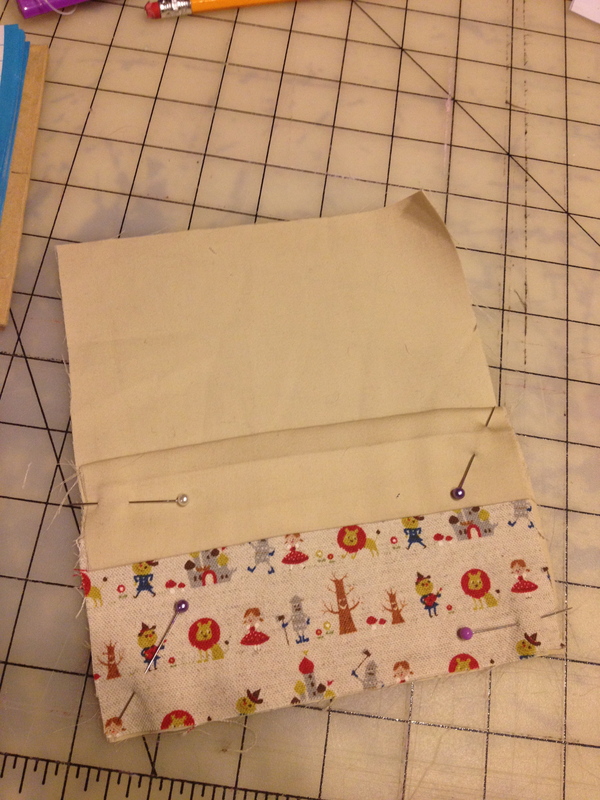 Fold down the inside piece and pin! Stitch the pocket in half, and now you’ve got two! Add your piece of ribbon (before you sew!) by folding it in half and placing it in the middle of your fabric sandwich on the right side, making sure the fold is in the seam allowance (on the outside), and the remaining ribbon is on the inside, that way, when you turn your project right-side-out the ribbon is on the outside where you need it! 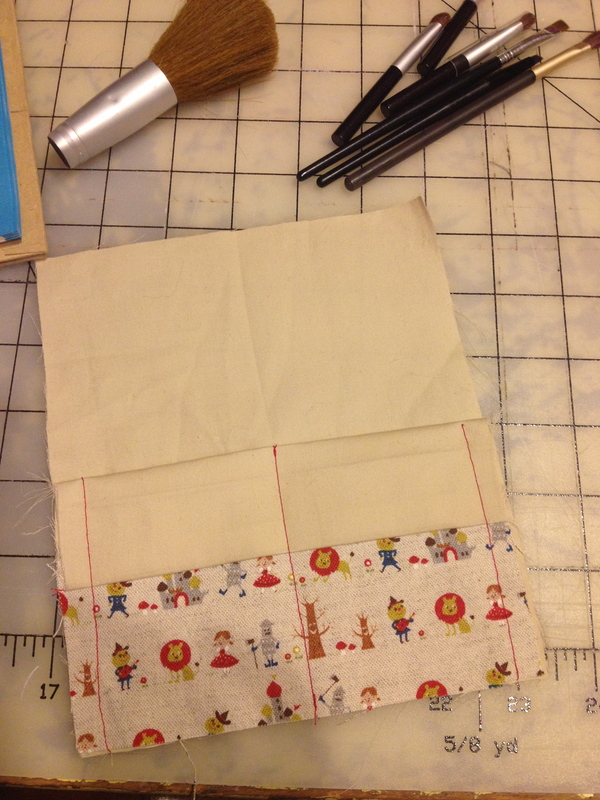 *I also encourage people to make sure and sew through all the corners, so when you turn your project right-side-out, your corners are all nicely formed so all you have to worry about is closing the remaining gap with a straight seam. 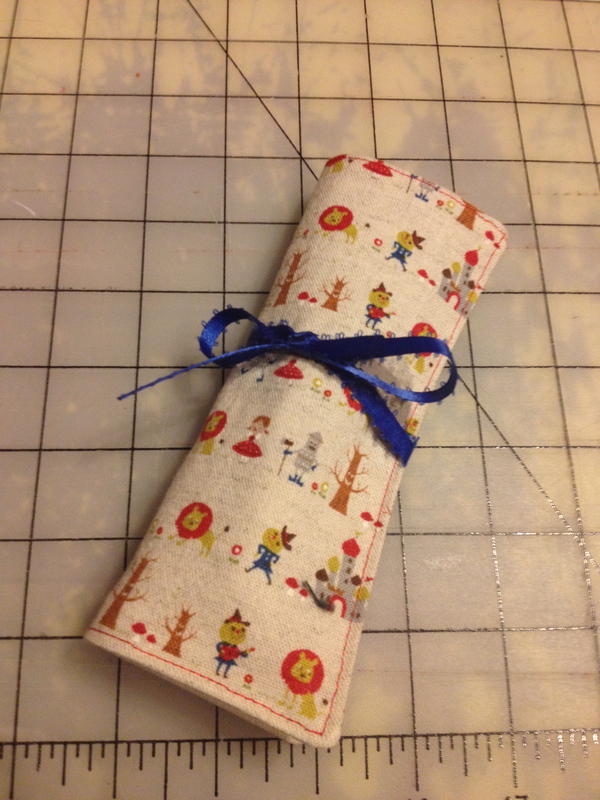 Cute fabric sandwich, with ribbon nowhere near the seam line. When you have sewn your seams, unpin, and (after making sure everything is correct!) 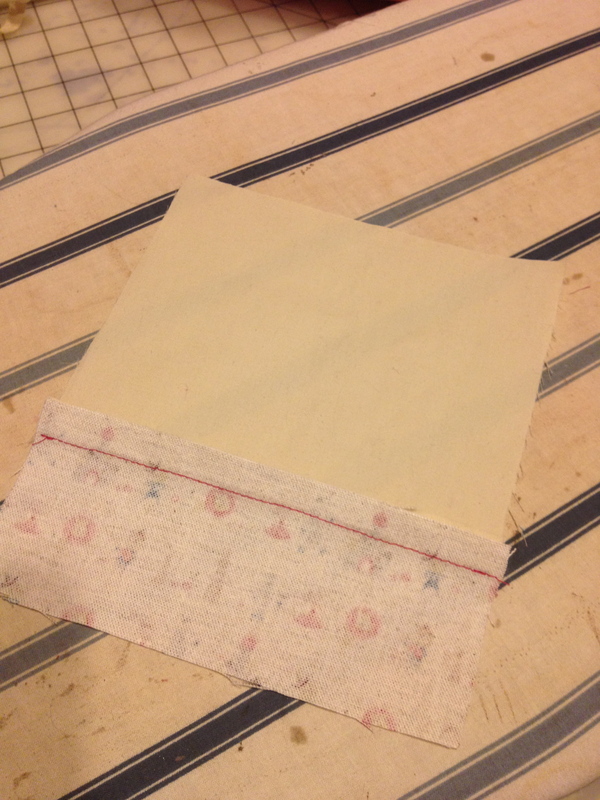 clip the ends off your corners (being sure not to cut too close to, or through, the stitching), then turn and iron flat. Since you’ve got to close that turning gap anyway, go ahead and top-stitch all the way around the edges of the MBH, this also serves to make it look super posh and professional. And you’re done! You (and I) have a fabulous little MBH that is completely personal, themed and utilitarian. Mine fits perfectly into my new makeup bag, helped to make a Saturday afternoon delightful AND productive, as well as inspired me to make some for my Etsy shop! 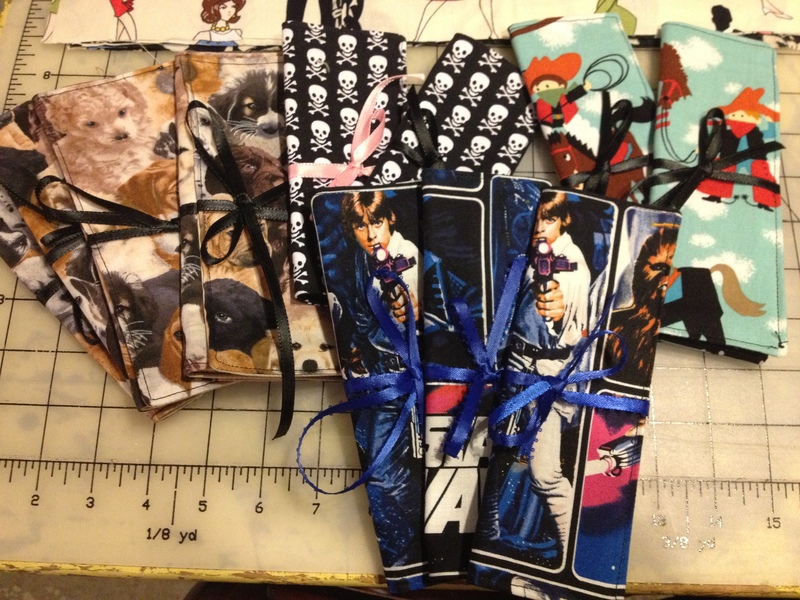 PS – I am making lots more, and adding another inch to the height, making this a perfect pencil/pen case/holder! 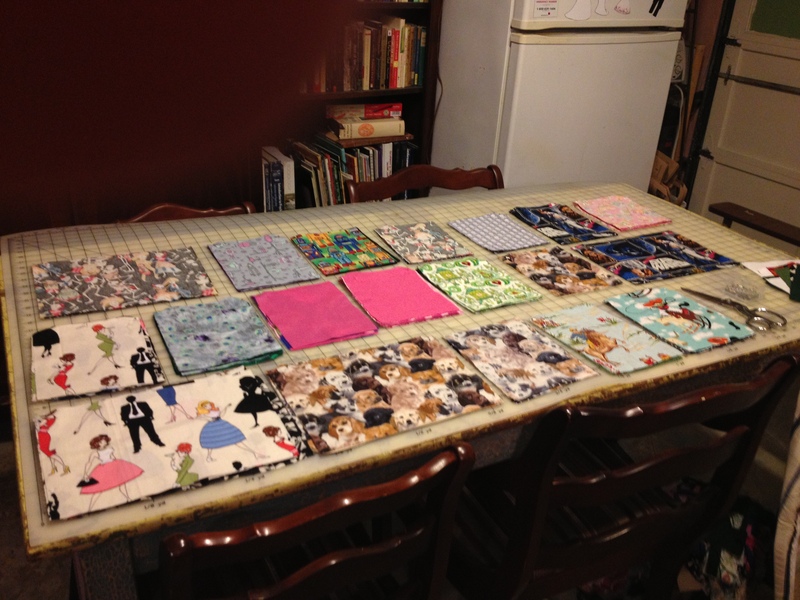 I also created a few with three pockets (whoa! ), for those of you lucky enough to be overwhelmed with lots-o-things to creatively store! They’ll be up for grabs at the Houston Pop Shop the weekend after Thanksgiving! Next Post Pants: Yay or Nay?